It’s almost impressive how meticulously bad Check It Out! With Dr Steve Brule is—and here I mean the fictional public-access talk show, not the sketch-based Adult Swim pastiche—but it can be very predictable. Every transition will be flubbed, every name will be mispronounced, every interview will be off-topic. Of course, there’s variety in the style of accident. A shot could cut to the wrong scene, or it could cut to the right scene and not be in focus, or it could cut early, or it could not cut, the camera falling to Brule’s crotch instead—mistakes that all occur in the second-season finale, "Life And Death." But every time, right on cue, the wrong thing will happen. The mistakes are funny enough in 10-minute bursts, but can become numbing in greater doses. Last week’s “Animals” is particularly inundated with bad direction, but it’s also aggressively off-putting in other ways—the gurgling sounds of a man’s stomach, the flattening overuse of “dingus,” and the slobbering, barking guard dog—so that seems to be the point. Reilly’s Brule has almost none of the satirical edge of Stephen Colbert or Sacha Baron Cohen. He’s closer in style to Harry S. Plinkett, the sputtering, misfit Mike Stoklasa character who reviewed Star Wars Episode I: The Phantom Menace on YouTube for Red Letter Media. But unlike Plinkett, Brule’s social dysfunction is the whole joke. His interviews aren’t in service of logical arguments but of awkward social interaction. It’s like Will Ferrell’s Harry Caray on Saturday Night Live, most obviously in the episode “Space.” In both cases a strange host squares off against gently correcting, subordinate straight men, played on Check It Out! by a formidable collection of supporting actors so believable it’s hard to tell if Reilly isn’t the only one acting. Brule hardly seems rich enough a character for so much screentime, but Reilly’s become deft with his arsenal of quirks—a twisted mouth, mumbled lines, limited eye contact—and every now and then, he finds a surprise in the perfect spontaneous expression or gesture, and Brule becomes that much more interesting. But the interviews on “Life And Death” mostly shy away from lampooning news shows. The segments with Brule’s mom and the baby accentuate a different facet of Check It Out!’s sense of humor: 1990s absurdism. Like The Day Today and Brass Eye, both also news parodies, Check It Out! starts in formula and goes suddenly, heedlessly into the wild beyond. All the while it purports to reveal the truth about its news subjects, like the edutainment satire Look Around You. Laughing at something funny becomes laughing at straight-faced lunacy, the sudden weirdness augmenting the comedy. This is obvious from the first shot of “Life And Death,” the typical Community Calendar bumper with one of its best announcements yet as the familiar pixelated fireworks animations play in the background: “County and Surrounding Towns Closed. No More Information Can Be Provided at This Time.” You barely have time to read this arguably important information before the card goes about its usual humdrum blinds transition, like the narrator in Fishing With John tossing off some heightened explanation for the boring onscreen action. Other bizarre, irrepressible sequences burst through the Brule program like always, in this case a bowling tournament advertisement for short dads hosted by an announcer with a penchant for unnatural hand gestures and this week’s fortune with Carol Krabit, revealing that anyone who had a nightmare last night has been possessed by a demon. Even the Brule sequences are shot through with weird comedy. For instance, his fantasy baby is a little person in a diaper and a leash. But the interview with Brule’s mother reveals one of the strongest influences on the personality of Check It Out! : David Lynch. If John C. Reilly weren’t so comical-looking and the mistake-humor were cut, the scene could almost pass for a Lynch short. Ms. Brule-Pringle-Salahari is an old woman announcing she’s pregnant. The camera slowly pushes in on Steve’s contorted face as he learns his mother wants nothing more to do with him now that she has a new baby. Suddenly her cult leader and ostensible lover Mobin appears in the back, glaring at Steve, who becomes transfixed. “It’s not good that you’re here,” she says as an ambient soundtrack builds. Mobin speaks in a repetitive low rumble instead of words. “Yes, master,” she says. Other directors have worked with lo-fi aesthetics, from Harmony Korine’s VHS portrait Trash Humpers to any number of Danish Dogme ’95 auteurs, but Lynch’s work on film and digital video is more like Check It Out! in the way it masters the thrill of disorientation. It’s impossible to tell where that humming is coming from, or why that stranger is smiling at our hero, or how he got from home to this deserted alleyway, but it’s invigorating to discover that anything can happen. Check It Out! 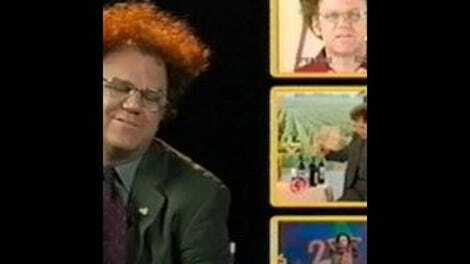 With Dr. Steve Brule isn’t just a public-access parody or a character study. It’s an exciting, inventive experiment surfing highs and lows together, a thoroughly modern pastiche of analog nostalgia, train-wreck television, awkward comedy, surrealist flights, and unsettling tactics. It’s easy to locate its stylistic influences and neighbors, but Check It Out! is ultimately unique, sitting alone on a branch of the increasingly essential Adult Swim, rocking back and forth at random, singing “Llorando” without moving its lips.